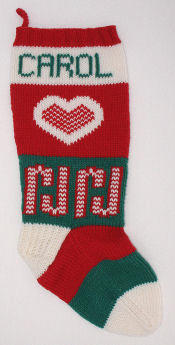 Here are examples of custom Christmas stockings that I've knit with candy cane pictures on them. Candy canes are a favorite Christmas treat, and they can have a very striking effect on either a green or a white background. Please look to see what Customers Say about stockings I've knit with candy cane pictures. This is a nice sized candy cane, not too small but small enough to fit in a lot of different spaces. The same candy cane has a different look in softer shades. Here it shares space with a petite angel. This large candy cane was originally a smaller picture. I took it to the computer and changed the design to get it to fill the leg. The snowflakes are embroidered on by hand, with sequins at the points for a little sparkle. The back side of the large candy cane picture has a few scattered snowflakes. They also have sequins, like the ones on the front. These candy canes repeat around the stocking, and could be varied in size. 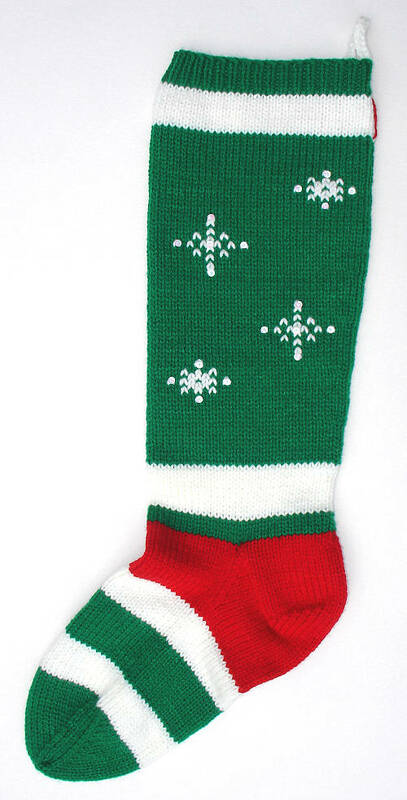 I created this stocking to match the style of an existing one that had different pictures. This candy cane design is very popular. It consists of a red outline on a white background. The appearance of stripes is a bit of an optical illusion. If you'd like a stocking with candy cane pictures, find out more about ordering custom Christmas stockings. Return to Custom Christmas Stockings.